Outpost Hope One is located at the terminus of Geroch Wormhole. The United Federation of Planets has continued to expand within the Delta Quadrant and is anchored by Starbase Phoenix and Starbase Horizon II. The United Federation of Planets, however, is not alone in exploring the Delta Quadrant. Elements of the Romulan Star Empire, Klingon Empire, Orion Syndicate and other Alpha and Beta Quadrant jurisdictions also actively explore and colonize the Delta Quadrant. The Delta Freedom Alliance is modeled on the original Federation Charter of peaceful exploration that includes Delta Quadrant natives, persons of Federation origin and others that feel the DFA is the best hope for a peaceful, prosperous society. Although much diminished, the Nal'Gaharay remain a subversive terrorist organization with a mandate to expel those not native to the Delta Quadrant. 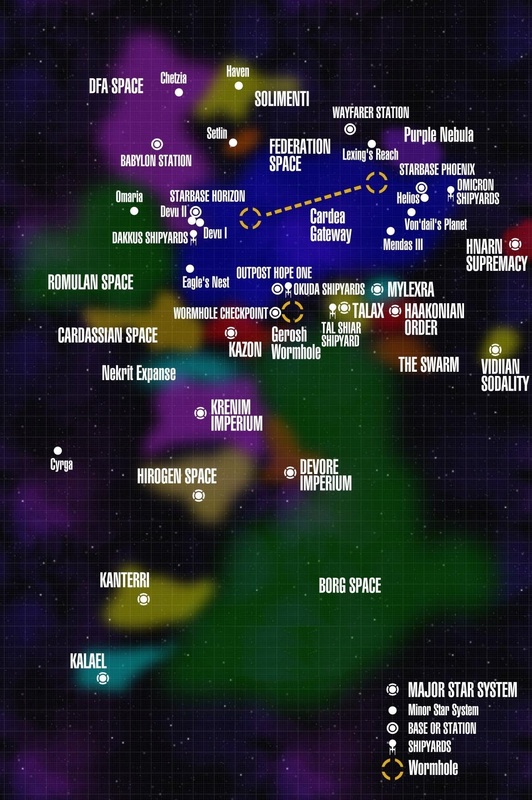 Map created by Jonathan Moore, a former Star Trek: Borderlands player.